A week in Slovenia will give you enough time to discover some of the most popular attractions. The small size of the country means it’s simple to visit two or three destinations on the same day, which makes exploring Slovenia very easy. After seeing the main natural, historical, and cultural attractions, you will be ready to plan your next trip to Slovenia to experience even more of this beautiful country. Discover Slovenia’s capital, Ljubljana. Join a walking tour of the city or explore the most famous attractions on your own. The Prešeren Monument, dedicated to Slovenia’s most celebrated poet, is an excellent starting point. From there, head across the Triple Bridge, over Ljubljanica River, towards the old part of Ljubljana where the narrow streets reveal the architecture and charm of the medieval era. Stop at the Cathedral of Saint Nicholas, Robba Fountain, and the Town House. Make your way back to the river and take a rest stop and feel the local vibe at one of many cafés on the river bank. After your coffee break, visit one of Ljubljana’s many museums and galleries. Complete your day in the capital by attending an event at the outdoor venue Križanke, or by going to a concert at the Metelkova Art Centre. Spend your day on Slovenia’s beaches. Start your day in Koper. Walk to Tito Square, where buildings showcase the Venetian influence on the town’s history. Visit the City Tower, Praetorian Palace, Foresteria and Armeria, and the bridge-shaped Fountain de Ponte. Before heading out, enjoy a cup of coffee with a sea view at one of the local cafés. Next stop is Piran, the most beautiful of Slovenia’s seaside towns. Visit Tartini Square and explore the typical narrow streets of Istrian towns. Walk up to the Church of St. George, from where on a sunny day, the view stretches all the way to Croatia. The last stop is Portorož, the liveliest of the three towns. Browsing in one of the many shops, followed by a traditional Istrian dinner at a local restaurant will make for the perfect end to the day. Visit Lipica, one of the oldest stud farms in Europe. Since the 16th century, this farm has been breeding the beautiful Lipizzaner horses. On the farm tour, you will get familiar with the history of the breed, visit the horse’s stables, and can watch a display by the Classical riding school. Continue towards Postojna, to visit Postojna Cave. The incredible Karst creations inside the cave have charmed more than 38 million people, which makes it one of the most-visited attractions in Slovenia. From the underworld, head to Lake Bled. Take a Pletna boat ride to the lake’s island, where you can make a wish while ringing the church bell. Back on shore, the traditional pastry Kremšnita is a must in order to have the true Bled experience. The town of Bovec will be your starting point for exploring the Soča Valley, named after the emerald green river that runs through it. A 25km hike on the Soča Trail will let you explore the most beautiful parts of the Valley. You will see the source of the Soča river, fairytale-like hanging bridges, the great Soča Gorge, and more. If hiking is not what you are looking for, you can head out on one of the cycling trails, or get your adrenaline pumping while you are white water rafting, kayaking, or canoeing on the river. On your way back from Bovec to Ljubljana, drive over Vršič, the highest mountain pass in Slovenia. Soon after you reach the peak, stop at the Russian chapel, a monument commemorating the Russian prisoners who died while building the pass. Your next destination is Planica Nordic Centre, where you will get your adrenaline going again! A zipline at the centre simulates a ski jump and is the steepest zipline in the world. Your next stop before returning to Ljubljana is Škofja Loka, the best-preserved medieval town in Slovenia. Walk through the old part of the town and stop by the Granary, the Hofman House, the statue of Mother Mary, and take a photo of the beautiful 600-year-old stone bridge. After arriving back to the capital, enjoy a nightcap at one of the bars in downtown Ljubljana. Visit Celje and the famous Celje Castle, which was a permanent residence of the counts of Celje, the most influential dynasty in Slovenia. After the visit to the castle, explore downtown Celje and visit the Princely Palace, where you can learn more about the counts and even see their skulls. Enjoy lunch at a local restaurant and then head to Maribor. A visit to the Maribor Regional Museum or the National Liberation Museum Maribor will help you learn about the history of the second largest city in Slovenia. On your walk through downtown, stop at Rudolf Maister Statue, Maribor Cathedral, Old City Hall, the Plague Column and make your way to Lent. Located on the bank of Drava River, Lent is home to the oldest vineyard in the world. Visit the Old Vine house and do not miss the opportunity to end your day with a glass of wine by this incredible plant that has been producing grapes for over 400 years. 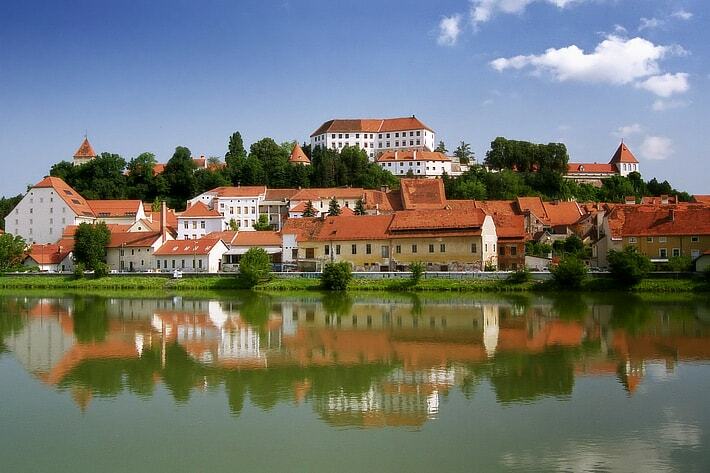 Visit Ptuj, the oldest Slovenian town and make Ptuj Castle your first stop. The castle hosts several exhibitions including the rifle exhibition, the musical instrument exhibition, and the colourful traditional Pust (carnival) masks exhibition. Make your way to the old part of town, where you can see the Orpheus Monument, the City Tower, City Hall, and Minorite Monastery. The rest of the day is booked for relaxation. Play a round of golf at the Ptuj Golf Course, located just outside the town or pamper yourself at the Roman-themed spa and wellness at Terme Ptuj.